Actvity Summary: Students use these questions to guide their reading of the Tales of the Resolution episodes focused on careers, technology, and science process exploration. They are designed to support Common Core State Standards for English & Literacy in Science. These educational activities are designed to support mastery of the College and Career Readiness anchor standards identified in the Common Core State Standards for English & Literacy in Science (http://www.corestandards.org/assets/CCSSI_ELA%2 0Standards.pdf). 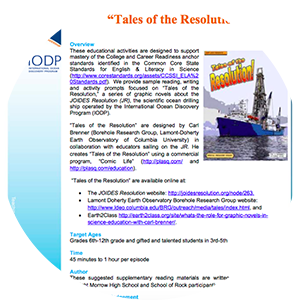 We provide sample reading, writing and activity prompts focused on “Tales of the Resolution,” a series of graphic novels about the JOIDES Resolution (JR), the scientific ocean drilling ship operated by the International Ocean Discovery Program (IODP).